This is a tutorial on using DataMax and SpekWin on Windows 8.1 to measure an emission and excitation spectra of a test sample of fluorescein in water made to have an absorbance of ~0.1. There are two hallmark positions used to used to ensure that the monochromators are at the correct wavelength. For the excitation monochromator there is the Xenon Lamp maxima which peaks at 467 nm. The emission monochromator is parked at 650 nm while the excitation monochromator is scanned from 200-600 nm. The sample compartment is left vacant. For emission monochromator there is the water Raman peak at 397 nm. The excitation monochromator is parked at 350 nm and the emission monochromator is scanned 365-450 nm. The sample compartment is occupied with distilled water in a 6Q quartz cuvette. It is recommended to carry out this check on the instrument every use and to monitor the magnitude of both peaks with respect time as an assessment for the condition of the lamp. These are the two raw signals, the signal at the detector S and the reference R which is a measure of the lamp output. The magnitude of these signals in particular S is important. The signal of S should be within the linear range of the detector. The peak of your spectra should not exceed the linear range of the detector ~4,000,000 CPS in this model. A small signal should also be avoided when possible in order to get the maximum signal to noise ratio. Ideally the measured peak should be between 2-4,000,000 CPS on this model. These corrected signals depend on the Emission correction factor MCorrect and Excitation correction factor XCorrect respectively. MCorrect accounts for the non-uniform response of the detection optics such as monochromators and gratings but in particular the detector. The detector usually has the greatest influence on the MCorrect particularly at higher wavelength where its quantum efficiency falls. 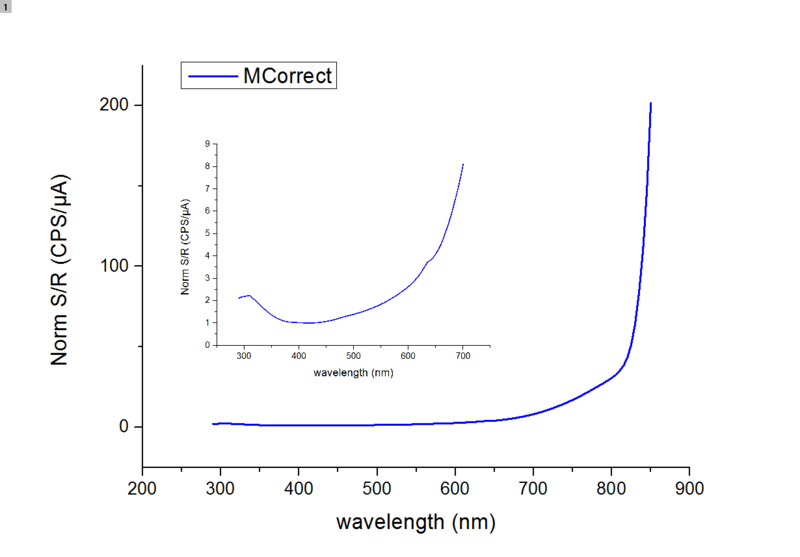 MCorrect is usually measured using a calibrated lamp with wide spectral output. The emission spectra obtained is then compared to the known lamp spectra and normalised by the lowest number to provide a MCorrect file. 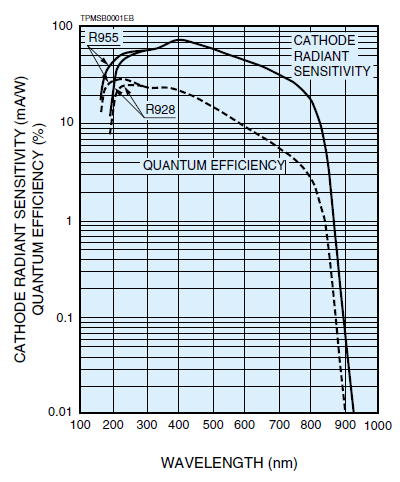 An illustration of the MCorrect file at lower wavelengths and higher wavelengths (right) and the quantum efficiency of the R928 (left). The XCorrect is another correction factor which accounts for deviations in the excitation optics in particular non-uniform lamp output. 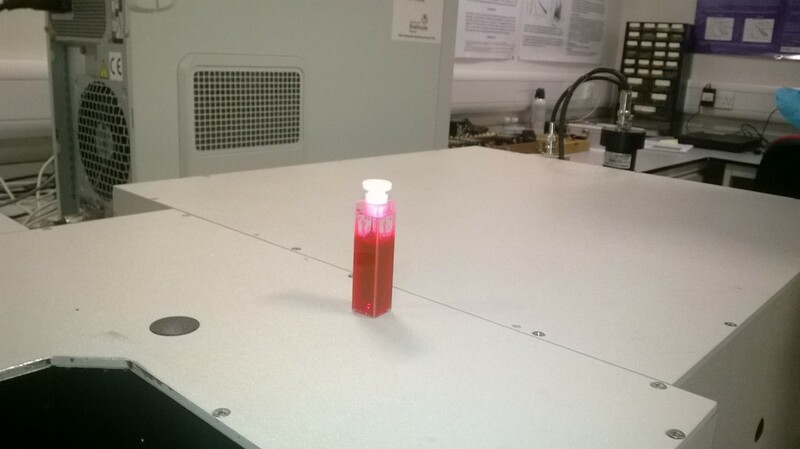 This is usually measured using a concentrated fluorescence standard; Rhodamine B in 1,2-propanediol at a concentration 8 mg/ml in a 6Q quartz cuvette. Dividing the Signal by the Reference accounts for deviations in the lamp output which is particularly important if comparing the sample with an earlier or later version. Sc/Rc is the final corrected quantity but it is often insightful to measure S/R in particular for samples which have weak fluorescence. The slits were too wide and the number of counts in S exceeded the range. The slit widths were changed to 0.5 nm respectively and the experiment was run under otherwise identical conditions. The background sample was ran under identical conditions and with a matched cuvette. The background signal is much weaker than the fluorescence signal as this is a strong fluorophore and can be neglected. However it can be much more significant for a weaker sample and will be taken into account with the analysis for completeness. Water isn’t fluorescent within the measurement range thus all thats being measured is noise. This noise gets a high amplification by the correction factor at longer wavelengths. This makes an artifact in the curve. The FluoroMax 2 is quite an old machine and isn’t as stable as its modern counterparts and exhibits some spikes which are distinguishable from the noise. → The measurement should be carried out multiple times to confirm. As DataMax is designed for obsolete versions of Windows, it cannot export to text and many of the analysis features don’t work 100 % the way they were originally intended. Fortunately SpekWin is a free download and can read the SPC files directly. Use SpekWin to load the three water background files by dragging them from Windows explorer to the SpekWin window. As mentioned the three curves look similar with the exception to the random spikes. SpekWin has a function to remove spikes. Go to Spectra → Spike Removal. You may overwrite the original and apply the spike removal to all spectra. As all three of these are the same sample, you may go to Calculations → Spectra Averaging. A dialog box will display and you may select all the spectra listed by holding Ctrl and left clicking them. Rename the average spectra as desired. Use SpekWin to load the three Fluorescence Emission files into the same project. Here you can see the magnitude difference of the fluorescence emission with respect to the background noise. However the same corrections and averaging can be applied to the emission spectra of fluorescein as was done for the background. The average Water background spectrum can be subtracted from the Fluorescein Spectra by using the subtract command in SpekWin. Data can be saved in SpekWinds format or exported to excel compatible .csv. This time the excitation spectra of fluorescein will be ran. Looking at the Fluorescence SpectraViewer I see that 550 nm is a good emission wavelength. As the peak signal was good for the emission measurement of the same sample, I maintain a slit width of 1.5 nm and 1.5 nm for excitation and emission monochromators respectively. I start the excitation scan at 300 nm as shown from the Spectra Viewer but also because a plastic cuvette is used which doesn’t transmit well in the UV. I end the emission scan at 540 nm (i.e. a wavelength at minimum smaller than the emission wavelength by at least the sum of slits in this case 550 nm – 1.5 nm – 1.5 nm). This should cover the full excitation spectra. For the excitation spectra the importance of dividing by the reference of the lamp is obvious as can be seen from the difference of the Sc and Sc/Rc spectras for example. Again the background sample was ran under identical conditions with a matched cuvette. Similar results are observed in that the noise gets amplified by the correction factor and that there are spikes which require multiple measurements and spike removal. Data Analysis is pretty much identical to the emission spectra. The emission spectra data can be dragged into SpekWin. The unwanted files can be deleted by selecting Spectra → Delete → Select for Deletion… Spectra for deletion can all be selected by holding down [Ctr;] and left clicking them. Once all spectra are deleted except the corrected excitation and emission spectra the excitation and emission spectra can be normalised by selecting spectra → normalise (or pressing [Ctrl] and [n]. 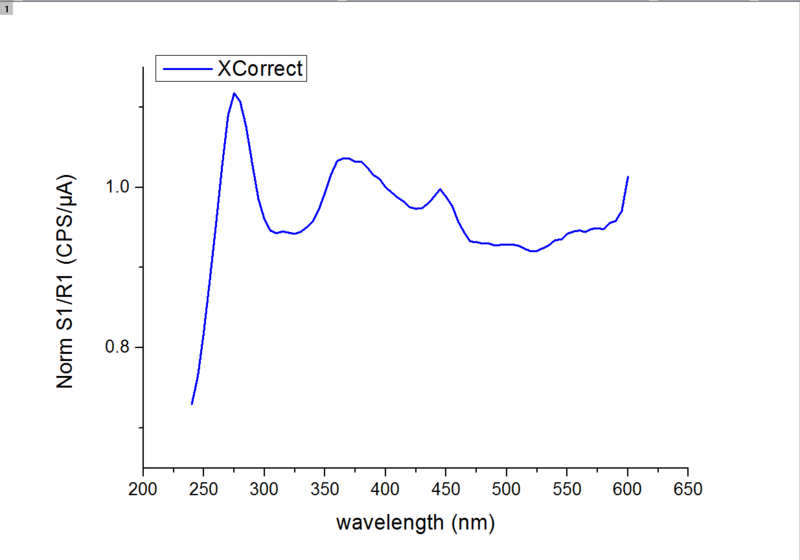 As seen the measured spectra resemble the absorption and emission spectra shown by the Fluorescence SpectraViewer. The excitation spectra should resemble the absorption if a mono-exponential dye is used and the sample conforms to the criterion that the absorption maximum doesn’t exceed 0.1.